Ever since I created a Facebook page for this website, I have been sharing stuff from non governmental organizations. 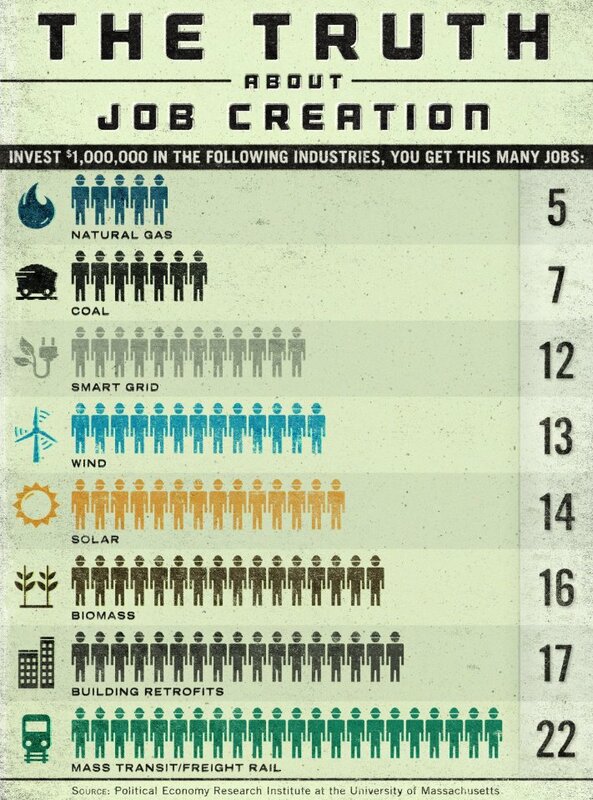 This allowed me to find a compelling image about an oft missed argument about cleantech : it creates lots of jobs. So to data gathered by 350.org, investing one million dollars would create 5 jobs in natural gas, 7 in coal, 12 in smart grids, 13 in wind power, 14 in solar, 16 in biomass, 17 in building retrofits and a huge 22 jobs in mass transit and light rail. That’s right, for one job in coal, you can get more than three in biomass, for one job in natural gas, you can get two in solar or three in mass transit. Simple maths, isn’t it ? choose to invest in clean solutions; reap clean air and water…oh and better food systems, every creature needs that..
most people seem to understand economic indicators, but fail to read numbers which show directions to sustainable living. Thank you Nadine for your comment. I agree with you that most people understand the basic economic indicators but not how the economy works. Regarding sustainability, the quasi totality of people fail to understand that we have to go for it and that it is actually GOOD for business AND people. I watched the election night on CNN and I was horrified of the amount of ads from coal and oil companies and how they are propagating utter lies and bulls..t with all the money they are amassing as we speak.